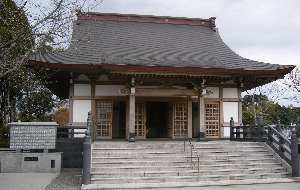 The temple at right houses a bronze Special Attack Peace Kannon (Goddess of Mercy), which is shown in the photo below. A memorial service is held each year on May 3 in front of the temple to remember the young men who died in aerial suicide attacks carried out by the Japanese Army during the Battle of Okinawa. In 1955, two former high-ranking former Army officers brought the kannon statue to Chiran for placement in the temple. General Masakazu Kawabe, Air General Army Commander, and Lieutenant General Michio Sugawara, 6th Air Army Commander, visited Chiran together with the kannon statue (Chiran Tokkō 2004, 9). Tome Torihama, who ran a small restaurant where she served kamikaze pilots during the war, played a major role in the establishment of the kannon statue in Chiran. In the early 1950s, she repeatedly proposed to the Chiran mayor that there be a kannon to console the spirits of the kamikaze pilots who made sorties from Chiran Air Base and to tell future generations about the great sacrifice that these young men made for their country. On September 28, 1955, the kannon was completed and placed in a temple at the corner of the former Chiran Air Base. After the kannon was placed in the temple, Tome walked to the temple every day to pray in remembrance of the kamikaze pilots. However, even though Tome's desire for a kannon in Chiran had come to fruition, others did not come to pray at the temple for many years. Tome also cleaned the temple. Sometimes she brought candy and gum from her restaurant, and she said to the young children playing nearby, "Everyone, if you clean the Kannon Temple, I'll give you some gum and candy" (Akabane 2001, 218). Even when Tome grew older and used a cane, she sometimes went to the temple with her grandson in a taxi. Eventually many people started coming to the Special Attack Peace Kannon Temple, especially after the opening of the new building for the Peace Museum for Kamikaze Pilots in 1986. By the year 2000, the number of annual museum visitors had grown to 540,000. In March 1942, the Tachiarai Army Flight School Chiran Branch started operations here, where pilot training took place day after day. Eventually in 1945, as the tense international situation became critical, Chiran became the Army's last special attack base as the mainland's southernmost air base. This is a land with deep feelings toward the about one thousand young brave men who died far beyond the flowing clouds as they set off on a bold mission and did not return. We honor the sincere pure spirits of these young men, and we pray for eternal rest of their spirits as they died a glorious death in the everlasting skies. The Special Attack Peace Kannon was made with donations from former officers and men related to Chiran in order to contribute to the restoration of eternal peace to their homeland. Now, through persons closely connected to Chiran with this same wish, we enshrine the kannon at the site of the former airfield in Chiran Town. In addition to this kannon statue, there is another Army kannon statue together with a Navy kannon inside the Special Attack Kannon Hall at Setagayasan Kannon Temple in Tokyo. Chiran's kannon statue with a height of 54.5 centimeters is patterned after the Yume-Chigai Kannon at Yamato Horyuji Temple, and it contains a scroll inside with the names of special attack pilots who died. Donations from Chiran Town residents were used to construct the temple to hold the kannon to honor and console the souls of these one thousand brave men for eternity and to extol their spirits. The monument inscription states the reasons for this kannon as we pray for the restoration of peace to our homeland. Behind the Special Attack Peace Kannon Temple, rows of stone lanterns honor the deaths of special attack (kamikaze) pilots who departed from Chiran and other Army air bases during 1945. Stone lanterns also line the main street of Chiran Town. These stone lanterns memorialize the deaths of the 1,036 kamikaze pilots who departed from Chiran and other Army air bases mainly during the Battle of Okinawa. The planned number of stone lanterns to be erected is 1,036. Donations from all over Japan financed the erection of these stone lanterns, based on specifications set by Chiran Town. In addition to the main street, the stone lanterns also line the entrance road to the Chiran Peace Museum for Kamikaze Pilots. 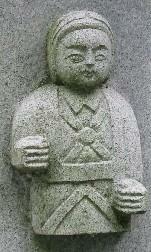 The base of each stone lantern has a stylized depiction of a kamikaze pilot. The two main types are a full-length figure and a pilot's head and upper body. The photos at right and at the bottom of the page show examples of kamikaze pilot depictions on the stone lantern bases. Donor names and erection dates also are engraved on the bases. Excerpts from Chapter 13 of Akabane and Ishii (2001, 216-22) were used for paragraphs 3 to 5 about Tome Torihama. Akabane, Reiko, and Hiroshi Ishii. 2001. Hotaru kaeru (The firefly returns). Tokyo: Soshisa.